Ava Duvernay attends the 3rd annual National Day of Racial Healing at Array on January 22, 2019 in Los Angeles, California. If there’s one thing to take from Ava DuVernay’s career journey, it’s that she has proven she is here to create a true legacy. Having already positioned herself as a huge film juggernaut, the award-winning filmmaker has made history (and bank!) in various ways, but always makes a note to pause and pass the baton to the next wave of filmmakers. 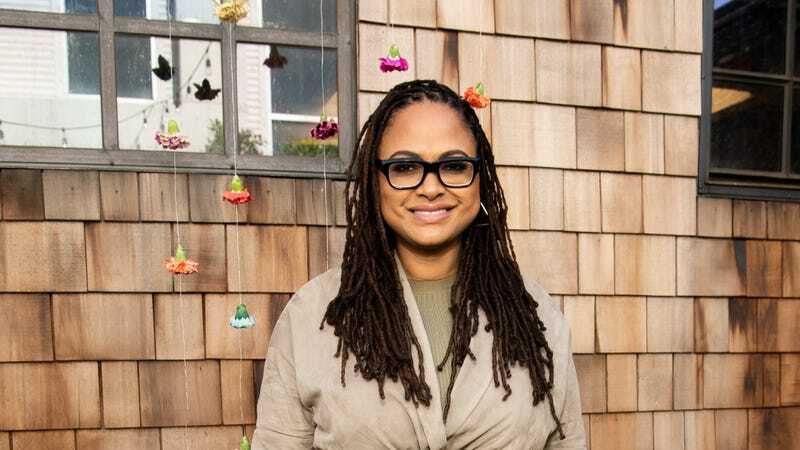 With her distribution company ARRAY (originally known as, African American Film Festival Releasing Movement, or AFFRM), DuVernay and her team have already acquired and released 22 titles, primarily giving black independent filmmakers a unique opportunity to showcase their work in theaters. Now, ARRAY is expanding to cut out the middle man — with their own theater. It’s an impressive achievement, but the next step in the compound’s buildout is a state-of-the-art, 50-seat theater that will screen the half-dozen ARRAY titles it plans to release in 2019 and work by local artists, and will be made available for rental. Located west of downtown Los Angeles — a part of the city that doesn’t house many media moguls — it’s also the area’s only independent theater. And it comes at a time when exhibitors are apoplectic over the impact of Netflix and other major streaming companies. I recently had the pleasure of visiting ARRAY’s headquarters, which they refer to as a “campus” — and for good reason. It truly does feel like being on a campus full of creatives. From its post-production suites to its airy (yet somehow, warm) main hall, ARRAY’s campus feels like home. And they have snacks! And yes, ARRAY is constantly evolving to maintain that they put their money where their mouths are. Even as DuVernay moves into the DC Universe with her next film, “The New Gods,” ARRAY’s plans remain firmly grassrooted. Last year, it partnered with Los Angeles Mayor Eric Garcetti and producer Dan Lin to launch the Evolve Entertainment Fund, which provides promotion, grants, and gap financing for communities historically excluded from the entertainment industry. And nonprofit arm ARRAY Alliance plans to create grants for African American, Latino and Asian American film festivals, societies and clubs, as well as support the screenings, curriculum, and teacher training that will help young audiences learn the value of art, independent film, and social justice. With the moves ARRAY is making already, they are certainly anything but traditional. And that’s a good thing. Staff Writer, Entertainment at The Root. Sugar, spice & everything rice. Equipped with the uncanny ability to make a Disney reference and a double entendre in the same sentence.